We want to thank Jan Jursa for having our CEO Philipp Huy as a guest on his show “Abends in der Kreativwirtschaft” last week. Philipp talked about the origins of Pidoco, the importance of collaboration in our software, and why Berlin was the perfect place to found a company. You can listen to the full interview in German above. Below is a summary of some of the topics. You can hear the original audio of the interview at Abends in der Kreativwirtschaft. Pidoco just turned 5, although the origins go farther back, of course. We chose the name from suggestions made by our users in the course of a name-finding competition. It can be interpreted as “Picture, Document, Communicate”. The most important thing for us was that it had to be memorable. Collaboration is becoming increasingly important for companies. 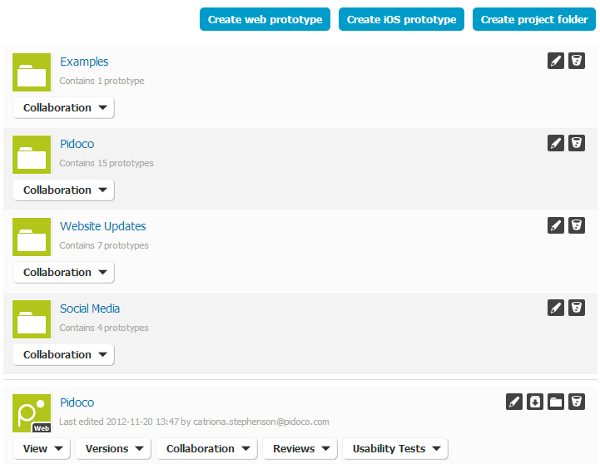 Pidoco’s real-time collaboration features are an important reason for users to choose our solution, especially with international projects. 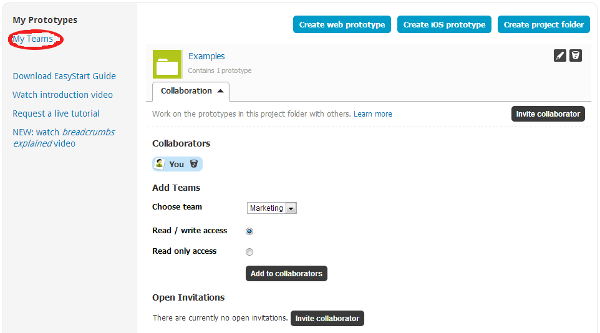 Collaboration has also been at the core of our product from the beginning on, in addition to our focus on keeping the tool as simple as possible, yet powerful for anyone to use. It’s the people that matter, and it’s certainly not always true that a founding team of four members sticks together through five years of business like at Pidoco. 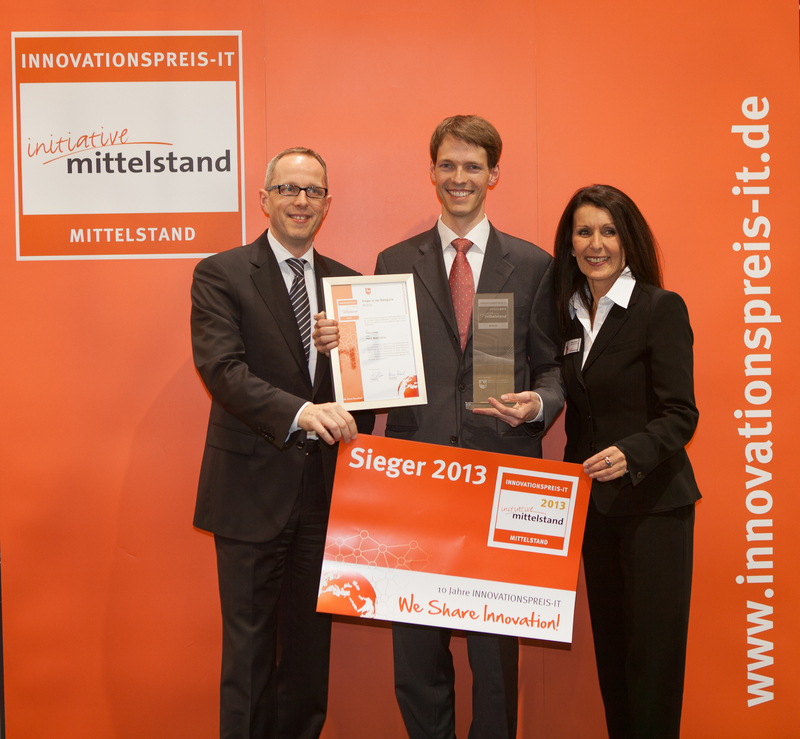 For Philipp, it was important to have a common vision and work towards the success of the company as a team. It’s also important to the Pidoco founders that work remains enjoyable, which is why we encourage collaboration through daily standup meetings where the team joins together, as well as presentations over cake on Fridays or occasional barbeques on the Tempelhofer Flugfeld. The hype of the Berlin startup scene is widely known, but why Berlin over places like Silicon Valley? 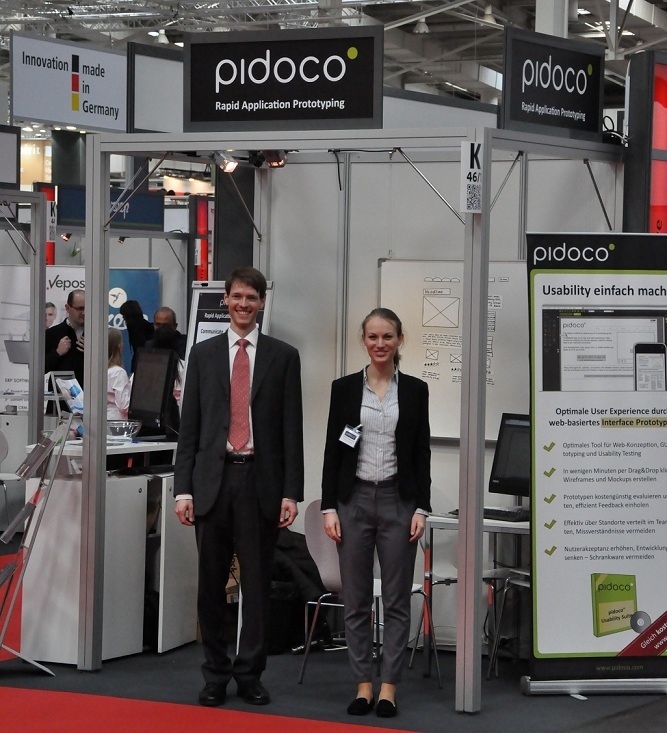 We decided Berlin was attractive for Pidoco because of the relatively low costs and the proximity to great universities, which meant there would be fresh talent looking to work at startups like Pidoco. How does Pidoco help Startups? We have a startup program because we want to give back to the community and encourage success. Startups are often looking for ways to make their ideas more tangible and convincing or test them on potential customers before they invest a lot of money. Pidoco can be a great tool for that since what better way is there than to quickly build a low-cost prototype? If you are a startup and interested in trying out Pidoco, contact us at support@pidoco.com to let us know about your project and see if you qualify for a discount. Jan Jursa is a UX consultant, editor in Chief of UX Storytellers and Co-founder of MobX. You can find out more about Jan on his website. We also recommend that you follow him on Twitter for your UX news. 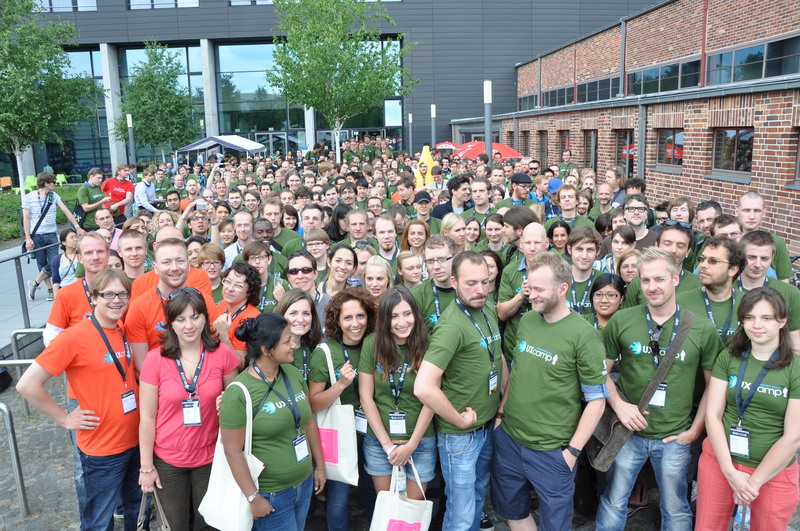 It seems almost incredible, but UXcamp in Berlin exists for already 5 years now! 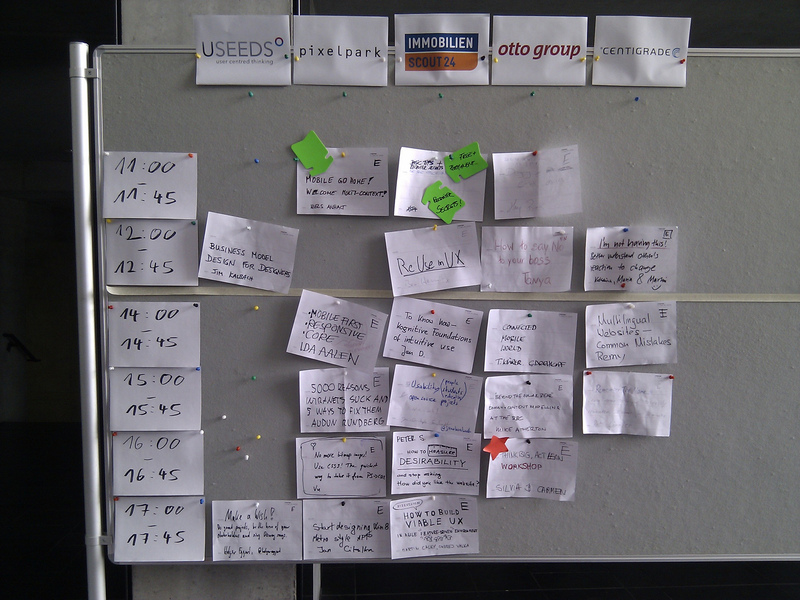 Pidoco has been supporting the UXcamp from the very first days by initiating and growing the event. When we started back in 2008 we were curious to find about 200 people interested in gathering for a weekend in Berlin to share all kind of things about UX with each other. The 5th time now there were more than 500 people coming from all kinds of continents, which feels just incredible to us. When we started to design the first UXcamp we took all our own experience from previous BarCamps and tried to figure out what is key to such an experience. It resulted in a whole lot of small details that we tried to execute to perfection while at the same time allowing for enough flexibility to encourage spontaneous ideas and creativity of the participants. Being the first time this year that I was able to just participate I was able to observe all those small details. Many of them still work well, but others are at risk to influence the overall participant experience. During several discussions, the big question was the size of the event and whether it might be too large already. It is difficult to say what the best size is, but I had the impression that it was a little too large this year. Especially during the session planning on Saturday, the Audimax was overcrowded with people leaving no space on the stairs and still standing at the doors. Since the opening session is really important to establish the intended experience, it is also important that everybody is able to fit into the room. The second big thing is the ticketing. First, I often heard people saying that you don’t need a ticket to come to UXcamp Europe, which is just not true. Yes, we never put anybody at the entrance to reject those without a ticket, but this is also one of the key parts to establish an open environment during the weekend. Therefore, we definitely rely on everybody to be honest with the tickets. Whoever thinks he or she can just appear at our UXcamp without a ticket I have to tell you that by this you are putting the participant experience at risk since otherwise the organising team might feel forced to hire security guys for the doors. Second, this year tickets were gone within a few minutes such that many many people ended up in a huge waiting list. We feel honoured to see so many people being interested in attending UXcamp Europe, but on the other hand there are also many people who grab a ticket in first place but don’t show up and don’t return the ticket early on such that others might have a chance to make use of those tickets. Returning the ticket just the day before the camp is not very helpful since people have to organise the trip a few weeks in advance by booking hotel and flights. What could be a solution? Selling the tickets for a low price is one. However, this would brake the original BarCamp rules and therefore, it is not easy to decide for such a solution. Another minor improvement might be to open just a few tickets a time such that people have several opportunities for getting one. Would this help much? I can’t say. Maybe this is a point where the shear number of interested people is just too big for our venue and we have to live with the fact that many can’t take part every year. Another thing that is always a risk for the participant experience: with so many people there are always a lot that just consume. These have to be remembered that a BarCamp heavily relies on the participant’s contributions. This time I didn’t hear of many such “consumers”, but I know there are. There are always things that have to be done during the event where the participants should give a hand to the organising team. It also should not be the role of the very same volunteers every year to do these things. I’d be happy to see all those “long-time volunteers” to be able to enjoy the whole weekend next time because there are enough others that willingly show up to help at the different spots, like the coffee bar, the cloak room, the help desk, etc. That said, let’s all together work on maintaining the participant experience of UXcamp Europe to be able to enjoy the same unique spirit also the next five years! The following is a guest post by Dominique Schmidt, UX consultant at Apliki. Enjoy the read. Through our work as a Psychological IT-Consultancy for User Experience (UX) we are often confronted with the request to make sure the clients’ product “achieves overall usability”. Through further exploration of the expectations behind this assignment we usually come to the conclusion that people expect a checklist-like tool, to ensure they meet usability standards. Of course this somehow reflects the guidelines approach of the DIN EN ISO 9241-11 and a number of checklists aiming to give non UX professionals the opportunity to quickly enhance the usability of their product. Small measures can often change a lot for the better. Yet, this approach falls somewhat short of what real usability means. There is not one kind of usability. 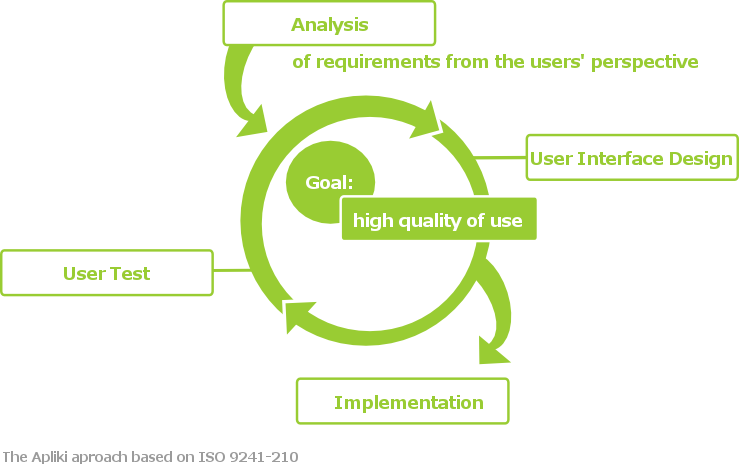 On the contrary, usability is highly dependent on the context of use of a product (DIN EN ISO 9241-11). Before we explore this notion further, let’s have a look at where this understanding of usability originates from. What is in usability checklists? The task of matching human behavior with machines is indeed a difficult one. For decades this question had been pretty much ignored and it is only in the relatively recent times of software development that the immense importance of this has gained widespread support. As a rule of thumb, one could say that the more potential mistakes there are for one topic, the easier it is to spot at least the most prominent ones. This also holds true for software usability. By following simple rules you can avoid the most common mistakes. This can be by avoiding certain UI elements that have proved to not work very well or by placing information in a structured format. These kinds of tips and tricks are especially well known because they can provide the answers to questions such as: “Does this work?” In addition, there are well known lists of usability heuristics (one of which is promoted by Jakob Nielsen). They provide more general guidelines to ensure “learnability” – defined as how easy it is for users to accomplish easy tasks on their first encounter with a design. The critical point is that these so-called heuristics do not work in a vacuum, but rather are dependent on the context of your software for valid application (remember the DIN EN ISO 9241-11). This leads us to the shortcoming of all- too simple usability rules. 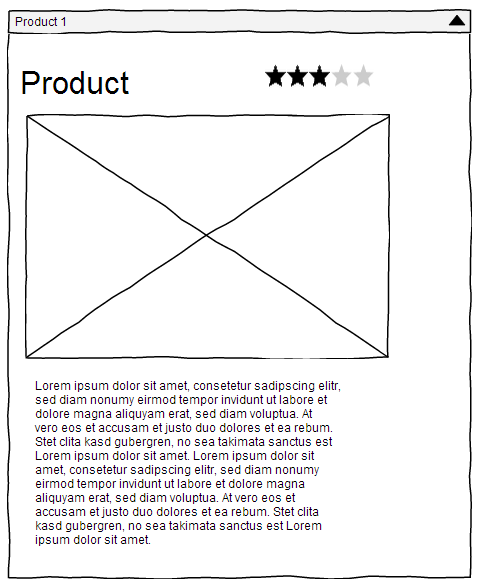 What are you going to miss with usability checklists? The key to success in defining your specific usability goals lies in two factors: research and documentation. Asking the right questions and pulling together the best data available helps you gain a valid understanding of your users and their environment. This understanding is then put into artifacts such as personas, goal descriptions, scenarios and UI-prototypes ensuring the whole team shares a common understanding of the product’s focus. Using these documents as a basis for every decision and conducting user tests of your prototypes will make sure you achieve optimal usability. Barcamps seem to be a growing trend these days and yet there are still a few people out there who have no idea what they actually are. I was one of them until I went to UXcamp Europe this summer. A barcamp is a user-generated conference (according to Wikipedia) where any attendee can volunteer to hold a seminar or workshop. UXcamp Europe was not only my first barcamp, but also one of my first real UX events. It was such a fantastic experience that I wanted to let you know about the mysterious world of UXcamp and inspire you to come along next year. UXcamp Europe began four years ago and Pidoco has been involved every step of the way, helping ensure everyone gets the most out of an informative and innovative weekend. This being my first ever UX event, I wasn’t exactly sure what to expect. I was amazed however at how much I got out of the weekend and what an overwhelming sense of community there was. When I arrived on the Saturday morning, the schedule had already been drawn up. I saw the noticeboard, which you can see in the image below, and realized that this conference was not like your traditional events where talks are planned out months in advance. I didn’t have a chance to look up the speakers on LinkedIn, or Google any of the topics, so I chose the seminars that sounded the most interesting. The first talk I went to was on UX blogging by the innovative German-language blog uxzentrisch. Not only was this full of useful tips on writing, but the seminar was a great opportunity to see the different ways we can look at UX and how we can show that UX is not limited to software interfaces. After this I also attended a talk on cognitive psychology by Jan Srutek. It was great to hear an interdisciplinary talk that not only looked into the theory behind the thought processes of users, but also offered practical advice about how to guide users in right direction through design. Another great talk I went to was on “The first run” by Paul Baron and Tomonmi Sasaki. This dealt with the first steps a new user takes to sign up for a product or service. The rules I learned were to show users they will be getting something great in return for the information they provide. Another thing they advised is to make signup forms shorter, or split these steps into stages if this is not possible. This is fantastic advice for anyone who is looking to revise a signup form, or payment process on their website or app. The last talk and my favorite had to be the closing keynote speech by Eric Reiss, a self-proclaimed UX evangelist. He used some great examples to illustrate that innovation should be used to solve problems, not create them. Here’s a picture of the Octoauto, which promised to give a smoother drive, but the price tag and the sheer size of the car meant that the inventor Reeves failed to generate interest for a single order. I love Eric’s commonsense attitude to UX, but most of all it’s fantastic to see the genuine support he has for the UX community. If you want to know more about Eric, You can follow him on Twitter, or read up about his theater and UX career on Wikipedia. All in all, I had a fantastic weekend, a great introduction to UX and I can’t wait for my next barcamp. I wish I could go to UX Camp Hamburg, but Philipp from the Pidoco team will be there. 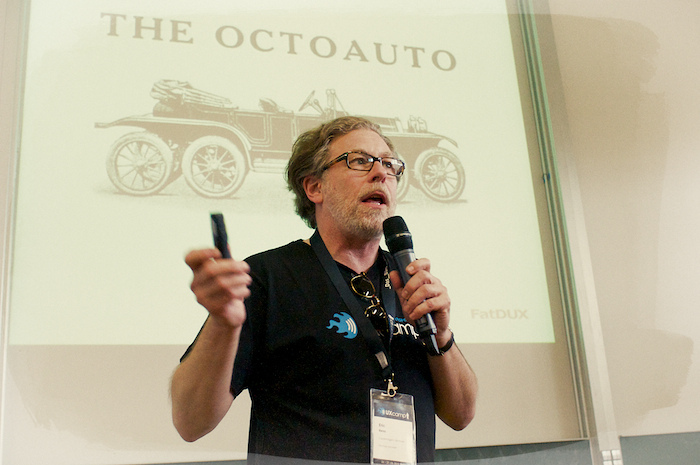 I’m already looking forward to next year’s UXcamp Europe, which I’m sure will be bigger and better than ever. See you all there!